As a company grows, it can be hard to continue with a first-name basis, and it can be unclear who’s who, and what’s what, when it comes to team dynamics, responsibilities and more. Depending on your goals, resources and company culture, the kind of team page you’ll need to create can vary pretty widely. 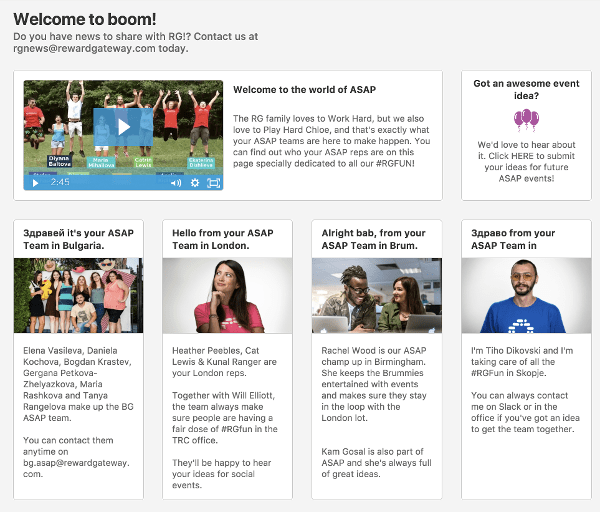 Your employee communications platform and internal communications tools are critical to connecting your people to your purpose, mission and values, and a great way to highlight this even more is through a team page. Our Leadership page has an in-depth bio of each of our nine leadership members, links out to our monthly Mission Report for our shareholders (including all 355+ employees of Reward Gateway, since we’re all a part of our employee share plan) and even shares some of the top reads from the team. Linking your people to your mission is more than just plastering it on the wall (though it does look nice and bright in our offices!). Reinforcing your mission, purpose and core company values on strategy-focussed pages helps employees feel like they’re a part of something larger than their individual responsibilities or team. A quick note is that sometimes these pages can be brought down with a tonne of company jargon that no one understands except for the people on these pages. It’s important to keep them human and drill down to what’s important. Bullets or simplified definitions can help keep these “heavy” pages nice and light so more people will pay attention and understand the content. If a constant barrage of questions is leading to a lack of efficiencies and administrative headaches for a particular team, an FAQ-style page may be best. I’ve found this helpful for our own IT team and People Team to house important new starter documents. Since we store everything in the cloud, it’s easy for me to update on the fly with the latest versions of documents. And, like other team pages, it helps put a friendly face (in our case, three faces!) to the masters behind our technology and security. 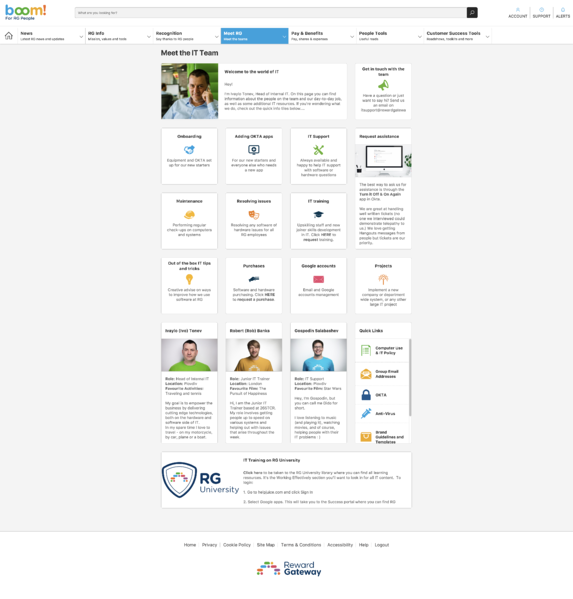 Since we’ve built out some of our learning and development courses to include IT Training, we can link out to our “RG University” portal so new starters or those who need a refresher can quickly and easily find answers to their most pressing IT questions. For those who don’t know their Google Drive from their Google Maps, it also houses a couple tiles on the team’s top tips and tricks far beyond the “Turn it on and off again” advice, which also happens to be the name of our ticketing service! Our world is full of different personalities and people quirks — and that’s how I like it. Teams take all shapes and sizes, and our ASAP 'team' is in charge of our social planning for each office, working together and individually. Team activities help build and maintain company culture, collaboration and bring fun into the spotlight. For our self-proclaimed party page, we’ve got a short video introducing the offices and sharing some of our top office party moments. A variety of formats. Something like a short, funny video introduction can be appropriate for personality-forward pages. Little moments that make people smile. Our Recruitment Team like to post a "Joke of the Week," other post photos of our four-legged friends or a section highlighting achievements and awards. 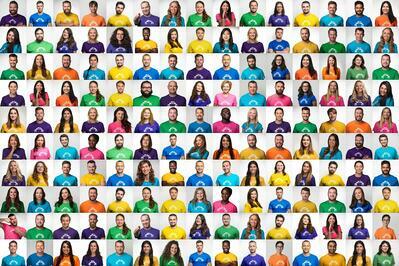 I wanted to find a home to show others in our global company how they could help me do my job to the best of my ability, but also to introduce our internal communications philosophy — keeping our employees informed, educated, inspired, connected and entertained. 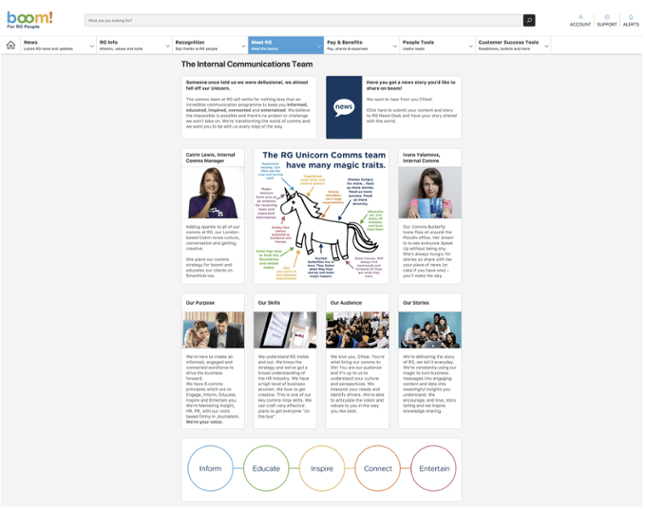 On the internal communications team page, we use the space to introduce the team, educate the company on our communications strategy and deliver internal communications tools to help employees contribute new stories and team successes that we like to shout about. A clear call-to-action. How can people in the company help this team, whether that’s through a feedback form, a request to share information or taking a pulse-style survey. A framework to help people understand a team philosophy. Similarly to how you’d describe your company values, what aspirations and traits does your team have? 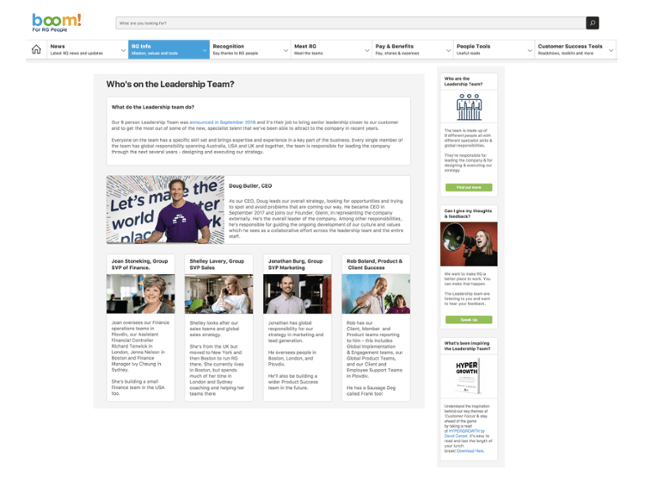 Need help dreaming up your ideal team page? Our Client Success Managers work with you and your team to brainstorm ideas that will help improve connections among your people while making your company purpose, mission and values shine. Or pop by my LinkedIn page, and I’ll show you a few more tricks up my sleeve!